In my last post I talked about the importance of ensuring medicines are only obtained from qualified suppliers. Equally important is the obligation distributors have in ensuring that only wholesalers or persons entitled to supply or administer medicines receive medicinal products. Wholesalers have a key role in guaranteeing medicines are only supplied to authorised organisations and qualified prescribers. This role is particularly important when supplying medicines with a potential for misuse. The MHRA has become aware that certain medicines subject to abuse, commonly diazepam, nitrazepam, zopiclone, tramadol and zolipdem have been leaking from the regulated supply chain and made available for sale in the black market and on illegal websites. These products are Schedule 4 controlled drugs under the Misuse of Drugs Act. Significant amounts of genuine licensed packs of these products from various manufacturers have been seized and recovered throughout the UK and Ireland. Wholesalers are reminded that they have an obligation in GDP to monitor their transactions and investigate any irregularity in the sales patterns of narcotics, psychotropic or other dangerous substances. Unusual sales patterns that may constitute diversion or misuse of medicinal product should be investigated and reported to competent authorities where necessary. In relation to wholesale distribution of scheduled controlled medicines to other wholesalers, companies must check their customers hold both a wholesale dealer’s licence and a Home Office controlled drugs licence of the appropriate schedule. For distribution to a wholesale customer, the checks that should be made are similar to the qualification of suppliers outlined in my previous blog. A hard copy of the CD licence must be obtained from your customers prior to any supply being made. For supplies to pharmacies, hospitals and clinics these organisations are not required to have a Home Office licence as their supplies are for patients. It is particularly important that the usage pattern is considered when fulfilling orders. We have seen pharmacies ordering up to a 2000 packs of these products monthly. That size of order is highly unusual for a retail pharmacy that does not hold a Home Office Licence. There should be procedure in place that sets defined limits to the size of routine orders that can be placed by customers that alert the company Responsible Person to investigate if excessive amounts are ordered. If you have concerns about your customers ordering of controlled or other drugs, in the first instance email the GDP Inspectorate. Please include details of the company and the name and quantities of products that have been ordered in the last 6 months. This will be dealt with in confidence. Other issues that arise in relation to customer supplies include medical practitioners who request supplies to their home address. The GMC medical register does not include the address of registered doctors so companies should avoid sending products to home addresses. Doctors operating in the independent sector will be working from clinics registered with the CQC in England, Healthcare Inspectorate in Wales, Healthcare Improvement in Scotland and The Regulation and Quality Improvement Authority in Northern Ireland. Medicines should usually be dispatched to these verifiable addresses rather than residential properties. For example in one case ex-employees of a slimming clinic used a doctor's GMC registration, without their knowledge to set up accounts with deliveries to their home address. 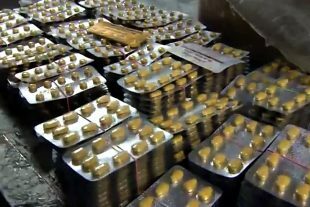 For wholesale distributors exporting medicinal products to persons in third countries, they must ensure that such supplies are only made to persons who are authorised or entitled to receive medicinal products for wholesale distribution or supply to the public in accordance with the applicable legal and administrative provisions of the country concerned. As an example we see companies attempting to export products such as Botox to doctors and clinics in the USA. The U.S. FDA only permits health care providers to obtain and use only FDA approved medications purchased directly from the manufacturer or from wholesale distributors licensed in the U.S. In certain circumstances, the FDA may authorize limited importation of medications that are in short supply. Such medications are imported from approved international sources and distributed in the U.S. through a controlled network, and would not be sold in direct-to-clinic solicitations. UK licensed versions of FDA approved drugs are not treated by FDA as equivalent and must not be sold into the U.S. to doctors or clinics. Finally, please be aware of any unusual orders that may come in from an export customer. Recently reported was an attempted large order of diazepam placed from a pharmacy in Africa. The purchase order was paid by a UK company purportedly acting on behalf of the pharmacy. They sent an individual in a van to the supplier, but with no paperwork to collect the products. The distributor was rightly suspicious and refused to hand over the products and reported the matter to us. Like the qualification of suppliers it is important that there is periodic rechecking of the authority to receive medicines for your customers and such checks must be documented. Hello Tony and thank you for the great blog. When a wholesaler dealer's licence lists more than 1 site, shouldn't there be a GDP certificate for each of them, too? There have been instances, where companies present a valid GDP certificate based on an on-site audit of let's say Site 1, whereas for Site 2&3 that are listed in the WDA, there has been no GDP certificates provided. Every site named on a wholesale dealers licence will be inspected and will generate a GDP certificate. As we have yet to complete a full inspection cycle since the introduction of GDP certificates there remain gaps, particularly for multiple site distributors. If they have a GDP certificate for one site, then that can be considered a good indication of the suppliers compliance with the principles of GDP. Thank you, Mark. This is really helpful! Hello Tony, Thank you for this informative blog. Can you please advise on the requirements for qualification of customers with regards to supply of GSL products to wholesaler's within UK by manufacturer's/MAHs? Further will it be mandatory to check the availability of valid WDA-H licence, as a part of supply qualification of super market chains handling GSL products? If qualification checks establish the customer is a wholesaler then they must hold a WDA(H) prior to placing any orders with the supplier. For supermarket chains deliveries of GSL medicinal products in to their distribution hubs is not wholesale distribution and a WDA(H) is not required to be held by them. If distribution for the supermarket chain is contracted out to a third party provider then those third party sites should have a WDA(H) naming the site where GSL medicines will be held. How much of a space per square foot is required by law to obtain a pharmaceutical wholesaler's licence? There is no minimum requirement for size of premises, given that different organisation do a variety of activities and scale of operations. Thank you for the enriching blog that touches upon unusual sales patterns. I'm to draw up an SOP on the topic. Could you be so kind as to share your expertise and advise on the main blocks to be highlighted in such SOP. Identify high risk products - narcotics, high value products, life style medicines within the warehouse management system. Pro-actively review sales of high risk lines to customers, look at order volumes, frequency of orders and who is placing the orders. Ensure that the right customer is ordering and receiving the products. Be aware of social engineering and the use of similar email accounts not directly linked to the customer. Verify unusual orders prior to shipment. I work at a Pharmaceutical company that produces medicines without a Marketing Authorisation and these are procured by wholesalers with a WDA (H). Typically any company who procures, buys or financially purchases, medicinal products, should be authorised via a WDA, whereby the site (invoice address) is listed in the WDA and has the relevant medicinal product class, wholesale operation and products with additional requirements stipulated. Some wholesalers with a chain of Pharmacies procure medicines from us and request delivery of the medicines direct to the Pharmacies. My question to you is regarding verification checks for wholesalers where neither the invoicing address nor the delivery address appears on the wholesalers WDA (H). The delivery address is a registered Pharmacy however the invoicing address could be the head office of the company that owns the wholesaler or the wholesaler subcontracts the invoicing to a third party. What verification checks would you recommend? Thank you for your question. The GDP team have advised that when considering qualifying integrated companies that are wholesalers with a chain of pharmacies the focus of the customer verification checks should be to ensure that the product is being delivered to either a site named on the WDA(H) or a registered pharmacy. Where the invoice address does not directly link to the delivery address, then provided the customer has confirmed that is how they will process payments with your company then that is acceptable. There is no requirement for sites that pay invoices to be named on a WDA(H). Thank you Mark. Your comments are very helpful. Thank you for the above Blog, I would like to ask on Customer (GP Surgery) I understand that they should be rechecked periodically, but do you know if there is a set period that we should aim for. There is no set period required for the recheck of GP Surgeries authority to receive medicines. You should set a frequency that ensures that typical changes to Surgeries, such as new partnerships, change of personnel or premises ensure they remain approved customers. I have a question regarding schools and private nurseries - generally these are classed as businesses, so would they need to have a wholesalers licence? They are technically the end user because they would not be on-selling the products, but neither are they the public as such. Would welcome your thoughts on this? Dear Shaun, There are exemptions with Schedule 17 of the Human Medicines Regulations that set out how schools can be supplied with an auto-injector containing adrenaline, an inhaler containing salbutamol and pharmacy medicines that are used to prevent dental caries and consist of or contain Sodium Fluoride. Medicines other than that should be supplied on the basis of orders made by a doctor or a registered nurse acting in accordance with the written instructions of a doctor. Thank you for your quick reply. The products I had in mind are Sudocrem and Calpol. Following your feedback am I right in saying that we shouldn't then knowingly sell these products to a school unless they can provide evidence of orders made by a doctor or a registered nurse acting in accordance with the written instructions of a doctor? These products are GSL medicines and so don't require a written order and can be ordered by schools to be used by registered first aiders in line with the exemptions in HMR Schedule 17, part 5, exemptions from Reg 220 and 221.